FCI's ST100​ Thermal Mass Flow Meter Series can be calibrated to measure the mixed, dirty hydrocarbon gases resulting from tank loading and unloading operations. The loading and unloading of hydrocarbon products at tanker terminals, oil/gas refineries and chemical plants creates vapours that must be vented in order to avoid hazardous tank over-pressure conditions that can cause a rupture. While gas relief valve venting reduces the tank over-pressure condition, it increases a plant's carbon footprint and damages the environment. Tank vapour recovery systems solve this dilemma. They gather the excess gas vapours from tanks and send it to electric generating stations, where it is fed to large turbine engines that drive electricity generating systems. Vapour recovery requires highly accurate and reliable gas flow meters designed for rugged operating conditions with high turndowns to accommodate fluctuations in gas vapour delivery. FCI's ST100 Thermal Mass Flow Meter Series can be calibrated to measure the mixed, dirty hydrocarbon gases resulting from tank loading and unloading operations. 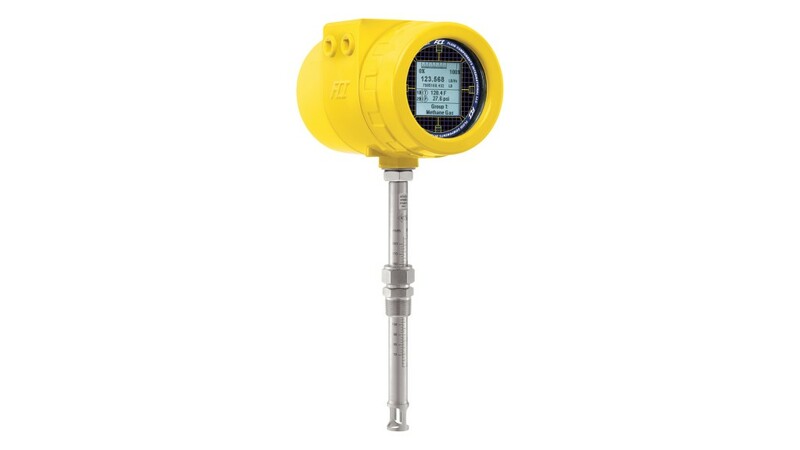 Featuring a thermal dispersion technology air/gas flow sensor with optional pressure measurement, this meter combines repeatable measurement with feature- and function-rich electronics. It provides direct gas mass flow measurement and requires no additional sensors or flow calculating devices. Its no-moving parts design also virtually eliminates wear, breakage and maintenance. The basic insertion-style ST100 Flow Meter measures air/gas flow from 0.25 to 1000 SFPS (0.07 NMPS to 305 NMPS) with accuracy of ±0.75 percent of reading, ±0.5 percent of full scale. A wide variety of pressure ranges can be specified from 0 to 1000 psig [0 to 70 bar (g)], depending on the specific model selected to support the most demanding applications. When specifying the ST100 Meter, users have multiple communication options. They can choose from: 4-20 mA analog, frequency/pulse, or certified digital bus communications such as HART, Foundation Fieldbus, Profibus PA or Modbus RS485. Should a production field or plant's communication needs change, a new replaceable card can be swapped out in the field. Designed with a graphical, multivariable backlit LCD display, the ST100 meter brings new meaning to the term "process information." Its sophisticated readout continuously displays all process measurements and alarm status for easy on-site viewing by technicians, and it has the ability to query for service diagnostics. The meter's electronics include a user selectable and programmable data logger. Readings are stored in a removable, internal micro-SD card. The micro-SD card has a 2 GB capacity capable of storing approximately 21 million readings. The recording time base is user selectable with a maximum rate of 1 reading per second. The logging feature is selectable via the front panel menu or via the serial port and configuration software tools. The feature-rich ST100 meter utilizes constant power thermal mass flow sensing technology that measures flow with 100:1 turndowns in ranges from 0.006 to 1850 SCFM [0.01 to 3140 NCMH]. The transmitter/electronics are integrally mounted with the flow body or can be remote mounted to 1000 feet [305m] away. The transmitter enclosure is NEMA4X/IP67 rated and available in painted aluminum or stainless steel. ST100 meters are agency approved for hazardous environment installations. FCI products undergo rigorous agency testing and obtain their approvals on the entire instrument, not just the enclosure. Approvals available for the ST100 Flow Meter include: FM, FMc, ATEX, IECEx, EAC/TRCU, CPA, NEPSI, InMetro, and CE Approved.